By Jonathan H. LiuOverview: With 2012 over, we can stop obsessing about the Mayans and start digging into other ancient civilizations. How about the Aztecs? Aztlán, named after the mythical homeland of the Aztecs, is a struggle for territorial control among four tribes, and each tribe’s strength waxes and wanes over the course of five ages. War isn’t the only path to victory, though—sometimes peaceful coexistence will be rewarded. There are four tribes, the People of the Quetzal, the People of the Serpent, the People of the Ocelot, and the People of the Coyote. Each of them is trying to thrive and prosper—peaceful coexistence can bring wealth and prosperity, but sometimes the gods prefer war. But at the end of the Fifth Age, only one tribe will be allowed to remain in Aztlán.Comment: Going by Liu's review, Aztlán doesn't say much about Aztec history or culture. I can't even tell if it uses the word "Aztec." The four tribes are Aztec-like even though they have animal names. 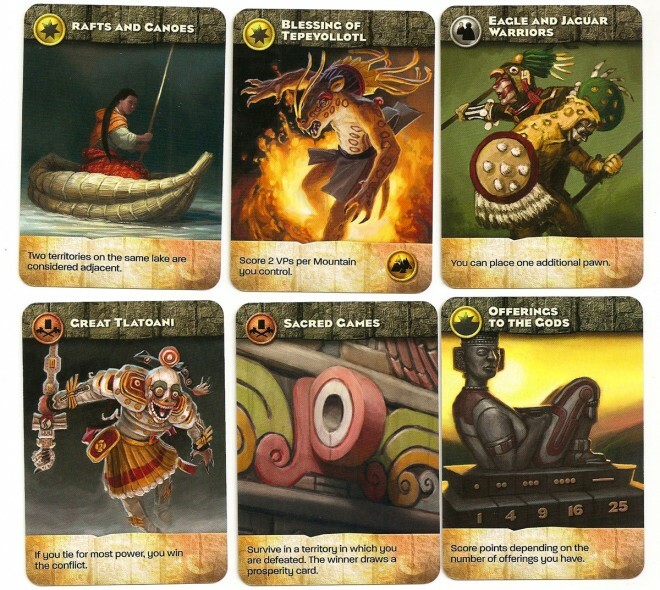 Judging by the art, though, Aztlán looks decent. It uses several Aztec words and concepts. And not just military concepts, but religious concepts as well. At least the game offers peaceful coexistence as an alternative to war. Since the Aztecs created an empire by conquering neighboring tribes, that's noteworthy. And there's no evidence of the most salacious aspect of Aztec culture: the human sacrifices. That's about all you can expect from a board game: superficial images of an "exotic" culture with no glaring mistakes or stereotypes. Good job. For more on the Aztecs, see Race in Revealing Eden and Aztecs Favored Universal Education.